In 1978, Jim Davis debuted one of the most beloved cartoons of all time – Garfield. Garfield is the original “Grumpy Cat.” When he’s not eating lasagna, he is sleeping, complaining, or pulling practical jokes on Odie, a fun-loving, but gullible, dog. Both Garfield and Odie belong to Jon Arbuckle, an awkward bachelor, who spends more time talking to his pets than he does to other humans. For the most part, the three live together in a mundane, though relatively peaceful, existence. 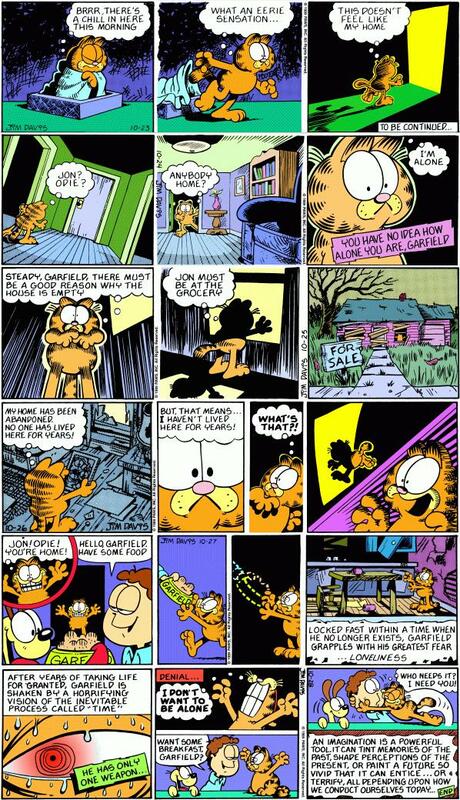 However, in October of 1989, Davis decided to press-pause on the light-hearted themes of Garfield to write a Halloween series that dealt with fear. Davis conducted an informal survey to find out what people are afraid of. The most common response was loneliness. I wonder how often we feel – or imagine – we are alone, when, all along, there were people ready and waiting to know and love us. If only we would open our eyes and break from our daze. I wonder how often we, who have been brought back into a relationship with God by the life, death, and resurrection of Jesus, forget that we are never alone. He has promised to be with us always – and God keeps His promises. If you feel alone, know that you are not or, at least, you don't have to be. There is a God ready and waiting to know and love you, if only you would open your eyes and break from your daze. You can read the whole comic here.